Outdoor exploration is one of the many joys of living in the midwest. It gives us an opportunity to interact with nature and experience life beyond our day-to-day realm of offices, traffic, and suburban homes. However, if we are unprepared for nature’s surprises, our outdoor adventures can lead to dangerous conditions. 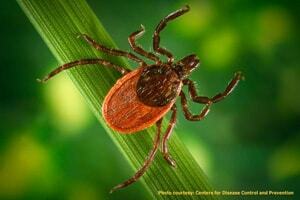 Tick-borne diseases (TBDs) are one of the many pesky outdoor dangers that can infest our lives and even become fatal. TBDs are particularly threatening to people who spend a majority of their days in high-risk tick areas such as farmers, DNR members, and soldiers. Yet, there is little research to suggest any kind of additional TBD knowledge or prevention strategies for these occupations. Dr. Claudia Munoz-Zanzi, Environmental Health Sciences Associate Professor at the University of Minnesota, set out to lay the groundwork for TBD research and prevention in her UMASH-funded pilot project Tick-borne Disease Risk for Agricultural Workers and their Families in the Midwest. The two part pilot project began with a collaborative analysis of TBD cases with the Marshfield Clinic Research Foundation (MCRF). The team was able to search through about 20,000 medical records of people tested for tick-borne diseases to determine temporal and spatial trends. In the last decade, a dramatic increase in TBD cases, particularly Lyme disease, has been observed in children. However, according to Dr. Munoz-Zanzi, learning about exposure risks, such as recreational, domestic or occupational, is not a cut and dry process. “Medical records generally only show whether or not the patient has been tested for TBDs, while exposure history is not systematically recorded” says Dr. Munoz-Zanzi. Additionally, recalling where a tick bite may have happened becomes more complicated among people who spend large amount of time outdoors. The second part of the project included a survey of both the Wisconsin and Minnesota branches of the US Forest Service to assess knowledge, attitudes, and practices among employees of high-risk tick occupations. “The survey aimed at understanding what workers know about TBDs, what they do to protect themselves, whether or not they know the risks, and how much effort they put into protecting themselves,” says Dr. Munoz-Zanzi. Although the Minnesota survey is not quite wrapped up yet, the Wisconsin US Forest Service survey has already shed some light. According to Dr. Munoz-Zanzi, the workers have a good level of awareness and knowledge about TBDs; however, many misconceptions and a lack of preventative efforts are still present which contribute to high infection rates. Overall, 25% of participants reported to have been diagnosed with a TBD. Locating high-risk tick areas and understanding how workers feel about TBDs is incredibly important information for the future of tick-borne diseases such as Lyme Disease, Ehrlichiosis, and Anaplasmosis. Knowledge is a vital key in staying healthy, and the findings suggest that more education, research, and prevention needs to be done. “There is a difference between hearing about the risks and actually having good knowledge to consistently engage in preventive practices,” says Dr. Munoz-Zanzi. Upper Midwest Agricultural Safety and Health (UMASH) Center’s pilot project program.